The planned new carousel building at First Avenue and Washington Street. 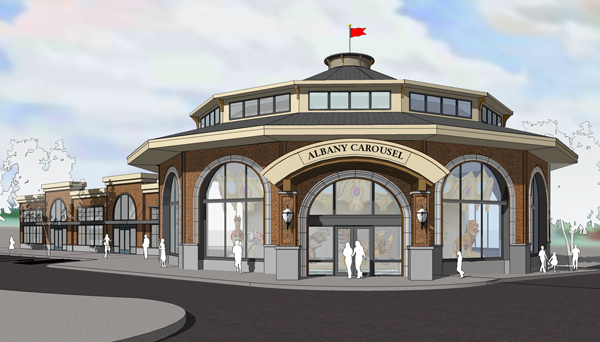 On the local front, the Albany Carousel is asking for urban renewal money for the third and final time. The request for $339,500 will go before the advisory board of the Central Albany Revitalization Area when it meets at 5:15 Wednesday afternoon at City Hall. The carousel has completed raising funds for its new building, which is expected to cost $5.6 million and will replace its current quarters at First and Washington. It is intended to be the showpiece western “anchor” for the downtown area. The organization says it needs the additional CARA money for street work including new sidewalks and benches along First ($209,500), for city permits and to cover systems development charges ($90,000), and for lead paint and asbestos removal ($40,000). In 2007, CARA gave the carousel $300,000 to buy the property at 503 West First Ave., where volunteers have been beavering away to make the 50-plus wooden animals and mythical creatures to be mounted on the antique carousel mechanism. In 2011, CARA contributed another $110,000 to pay for the new building’s design. Urban renewal financing, which uses a portion of property taxes, is based partly on the idea that public funds will be returned in the form of increased tax income once the urban renewal district ends, and partly on the hope that even non-taxable improvements will raise nearby property values, giving the same result in the end. When the carousel project launched some years ago, I believe Wendy Kirbey (?) was quoted in the Democrat-Herald that no public funds would be expended on this wonderful project. Well, she was wrong by $750,000. And CARA didn’t bother to estimate an ROI for this project (expected tax increment). Why? Well, as you noted, the carousel is a non-profit. In fact, they bought a tax generating property and removed it from the tax roll. Arguably, the tax increment is negative. So, CARA continues to violate its primary purpose (which is immoral, by the way) – giving money to wealthy owners/developers of private property downtown with the hope the ‘investment’ will result in a quantifiable increase to the tax base. And you didn’t even mention that CARA recently decided to spend urban renewal money to partially fund a new city-wide code enforcement position that will be housed within the APD for at least five years. When CARA started they funded one position, Now CARA funds 3 positions – 1 fully and 2 partially. It appears that the only things certain about CARA are a growing bureaucracy and lots of public money spent on projects with no quantifiable tax increment. So I ask – Has CARA violated the will of the people? It’s hard to say because the Albany City Council never asked voters to approve CARA’s creation or plan. Thankfully, a local measure passed several years ago now forces the council to get voter approval on future urban renewal districts/plans. For that Albany residents should be thankful. Gordon, your hatred of government is manifest. When you first moved to Albany you excoriated the Council for not improving Goldfish Farm Road after you demanded that they do it. The fact that the road section was not owned by the city, but by Linn County, made no difference to you. CARA has been your whipping boy/girl since it was founded. You have opposed all. You accused the Council of criminal activity, giving public money to pay off campaign support, without EVER PROVIDING ONE SHRED OF PROOF, to back up your scandalous accusations. You are the model that resulted in Trump. A dissembling liar who creates controversy when none has occurred. You talk of “not asking the voters” when state law clearly and specifically states that the City Council creates Urban Renewal Districts, not voters in a election. You completely ignore the extensive public process that was followed in the creation of the district, in absolute compliance with the requirements of state law. If the Council did not follow the law, PROVE IT. Or better yet, just shut up. Bob, you’re hyperventilating again. Sit down and relax for a moment. No, I didn’t complain to the council about Goldfish Farm Road when I first moved here. After living here for about 10 years, and just before Wal-Mart was built, I questioned both the city and the county on who was responsible for making improvements to a very unsafe road. I got conflicting answers. Evidently there is some dispute between the governments over rights-of-way and future ownership. The road contines to be unsafe all these years later. No, I have never accused the council of ‘criminal behavior’ when it comes to CARA. I have been critical of CARA and its funding model (TIF). It is immoral, but legal. I have never accused the council of not following the law in regards to the creation of CARA. Other councils have asked their voters to approve urban renewal districts/plans. I just wanted the same for Albany. It took an initiative petition to make it happen on future districts/plans. I am proud to have been a part of that effort. Yes Gordon, your palpable disdain for representational governance rears its ugly head again and again and again. Yes Gordon, that is exactly how URDs function much of the time. I seriously enjoy the major improvements downtown since our URD inception, the multiple new businesses there, the existing businesses CARA has helped to stay in town, the multiple homeowners who have been able to improve their properties through our program, etc. The result? Albany continues to grow and be a very-very thriving community. That really gets your goat doesn’t it… Guess what? Much more to come via the URD. Ain’t it great! Geez, Ray, you’re getting to be as bad as Bob when it comes to telling the truth. I do not “disdain’ representative governance. I just value direct democracy as an effective tool when representiative governance fails us. That is why the two initiative petitions passed several years ago with significant majorities. Albany voters clearly want to be the final voice on urban renewal districts/plans and city debt. Given CARA uses TIF, then CARA has a duty to show Albany residents the ROI calculations on CARA ‘investments.’ If CARA can’t produce a positive ROI for a project, then CARA becomes nothing more than a slush fund for the city council. Please don’t deceive Albany residents. Show us the numbers, Ray, show us the numbers. Kate has the ROI formula, how did the carousel project pencil out? By constantly harping on the process for voting, yes you are disdaining the process by which URDs are formed across the state. I stand by what I said. I’ll try it again vary slowly. The ROI figures are the increased value in the URD when we get the numbers done up by the county assessor each fall. As you already very well know, the URD has a very large number of projects that, by design, do not, and will not, ever have your definition of an “ROI” on an individual project basis. If the URD goes up in assessed value, then it is working — by design. It’s a great program and there’s more to come! HH, road trip? To Salem for research! Is their waterfront carousel successful? Positive impacts to downtown Salem? Benefitting the people in many ways? I’ve been there a few times in late spring/summer months. It is always busy. Adults and children milling about. Not to mention paying tokens to ride the ride …round and round. Many grandparents taking photos. ok…clarification…grandmas taking photos. As for CARA, I’m seeing that it is a real bone of contention. I need to do more studying on this entity to form an opinion. For now, I’m leaning towards moving forward towards carousel completion. Knowing human nature, I will have grand kiddos in a few years. It will be a wonderful destination for a weekend outing. Just because a property is owned by a non profit, taxes are still collected. After 9 years of no tax payments, the property should be put up for auction to pay the back taxes. Who else would get that kind of break? The Linn County Court hearing on our initiative petition was heard on 3/29. We await a decision. The IP seeks to stop the use of TIF monies except to pay off the CARA debt. Same one as Oregon City is trying to decide. We’ll see—more to come.